The Olathe South Falcons and the Shawnee Mission West Vikings will have a rematch of their Week 5 game. Olathe South won that matchup 31-21. Olathe South’s only two losses came 27-26 in two overtimes to No. 2 Olathe North and 49-0 to No. 3 Blue Valley. The Falcons also have quality wins against the likes of Hutchinson, Shawnee Mission West and Lawrence. Quarterback Jake Seurer leads Olathe South with more than 1,000 yards passing. He also has 80 tackles as a defensive back. Johnny Sands leads the Sunflower League with seven interceptions. Shawnee Mission West opened the season with a 1-4 record but is now on a four-game winning streak after victories against Olathe East, Shawnee Mission Northwest, Shawnee Mission South and Blue Valley North. The Vikings have played in a lot of close games. Two of their losses were decided by 10 points or fewer and two of their wins were determined by three points. Tarik Watson leads Shawnee Mission West with 929 yards rushing. D.J. Turner boasts 103 tackles and four sacks. The Lawrence Lions will have their hands full with the top-ranked and undefeated Shawnee Mission East Lancers. The Lancers have scored no fewer than 40 points in a game and have allowed no more than 19. The Class 6A runner-up last year, Shawnee Mission East has defeated every opponent by 23 points or more. Shawnee Mission East quarterback Gunnar Englund has passed for 1,176 yards and 19 touchdowns. Wyatt Edmisten has rushed for 918 yards and 21 touchdowns. Alec Dean has 498 receiving yards and eight touchdowns. Kyle Ball leads the Lancer defense with nine sacks. Lawrence’s J.D. Woods leads the Sunflower League with 1,497 rushing yards and 19 touchdowns. Defensively, Price Morgan has 120 tackles and Amani Bledsoe leads the league with 13 sacks. The Lawrence Free State Firebirds enter on a four-game winning streak. The Wichita Northwest Grizzlies had a seven-game winning streak halted with last week’s 35-28 loss to Hutchinson. Free State quarterback Bryce Torneden rushed for 113 yards and two touchdowns and passed for 67 yards and two touchdowns during last week’s 55-37 win against Topeka High. Torneden has rushed for 1,062 yards and 12 touchdowns on the season. KeShaun McGaugh leads Wichita Northwest with 1,191 rushing yards and 17 touchdowns. Junior Alex Bott has caught 22 passes for 405 yards and two touchdowns. On defense, senior Brendan Johnson has posted 79 tackles. Junior Joseph Weibel has 5.5 sacks. The Topeka High Trojans opened the season with a 5-0 record but went 2-2 over their past four games, falling to Shawnee Heights in overtime and Lawrence Free State this past week. Hutchinson, which is in its first year with Ryan Cornelsen as head coach, enters on a three-game winning streak. 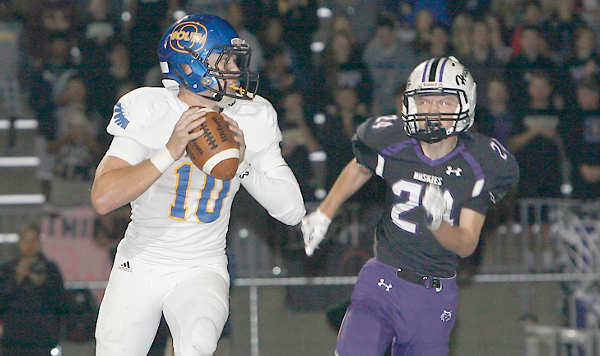 Senior quarterback Alec Beatty leads Topeka with 1,710 yards passing and 1,075 yards rushing. Junior Mike McCoy also has rushed for more than 1,000 yards and 21 touchdowns. Senior Khalil Austin has 42 catches for 865 yards and nine touchdowns. The Trojans averaged 538 yards of total offense and 53.1 points per game. Hutchinson started the season with a 1-3 record, losing to quality teams in Olathe South, Salina South and Derby. Since then, Hutchinson has won four of its past five games. The Salthawks are coming off a 35-28 win over Wichita Northwest to secure the district championship. Running back Blaik Middleton ran for a 68-yard touchdown to break the tie with 3:26 left. Middleton finished the game with 295 yards and four touchdowns.